Earnings season is upon us. Expect a lot of jumping around this quarter as companies miss or exceed estimates. Although earnings are important, they are also fickle and easily manipulated. That is why it’s always good to remind ourselves, as shareholders, of some of the long-term time-tested ways in which companies deliver value not merely over one quarter to the next, but over years and years to come. With the low interest rate environment we’ve been in since late 2008, courtesy of the Fed, there have been a number of companies that have consistently delivered value to their shareholders through a very powerful combination of two things: dividends and share buybacks. You probably know that I’ve been making the case for blue-chip dividend-paying stocks for quite some time. With low interest rates and steady inflation, dividends play a very important role for an investor’s total return (dividends plus price appreciation). 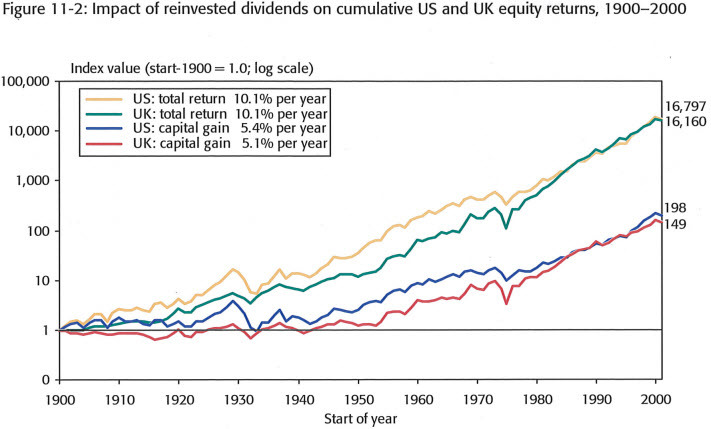 In their seminal work "Triumph of the Optimists: 101 Years of Global Investment Returns," authors Dimson, Marsh and Staunton show just how important the role dividends play in enhancing investment returns over the long-term. For example, a U.S. equity portfolio started in 1900 with an initial investment of $1 would have ended 2000 with a value of $198. This represents an annual compound growth rate of 5.4 percent per year. If dividends were reinvested that same $1 would have grown to $16,797, an annualized return of 10.1 percent (see chart below). In a low interest rate environment like we have today, this is even more important than ever. Blue-chip dividend-paying stocks are playing a primary role. For the first time in my 30-years of being in the business, stocks are actually paying a higher yield than bonds: the average dividend yield of stocks in the S&P 500 is nearly 2%, which is greater than what you can get for a 3- or 5-year Treasury bond. But, as I mentioned in the beginning, dividends are not the only way in which shareholders have seen increasing value over the years. The other way has been through share buybacks. Near the peak of the market in 2000 to now, S&P 500 companies that have bought back the highest percentage of their shares have also seen the highest historical returns over that period. In general, companies that have not bought back their shares have seen lower returns. We recently illustrated this by ranking S&P 500 companies from highest to lowest (in terms of share buybacks) and plotted their historical return over the past 10 years (see chart below). To show how this works in practice, let’s take an example right out of Warren Buffett’s playbook with his recent purchase of Exxon Mobil (XOM). 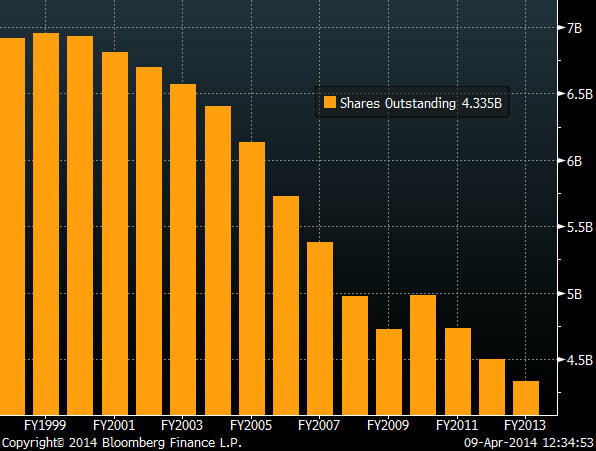 With regards to the last point, in the year 2000, Exxon had 6.9 billion shares outstanding. At the end of 2013, after share buybacks, Exxon had retired 40% of their stock with 4.3 billion currently outstanding (see below). Had you bought Exxon right around the peak of the market in 2000 at $35, along with the 180% increase in thier dividends over that time, you're making a 7% return on your original investment. If you look at the way Buffett thinks, when he bought XOM in 4Q 2013, he did so at a 2.8% div yield, which is about the same as a 10-year Treasury bond. However, if Exxon continues to retire their stock and increase their dividend yield, Buffett’s total value in the company will also rise nicely…especially if you think oil and natural gas prices will continue to rise over the long-term. This is not a recommendation to buy Exxon’s stock. Exxon is an example of blue-chip dividend-paying stocks, which have a special set of characteristics that make for an attractive long-term investment to people like Warren Buffett. So, even though all the financial news channels will be focused on earnings this quarter, let’s keep in mind what really drives value to shareholders over the long-haul. As our recent guest technician, Shelley Moen, said: stick to quality, buy value, and ignore the noise.